OPI polishes are a brand i hear about all the time on people's blogs, as a self confessed nail polish addict i was dying to try them after hearing nothing but great things. When i saw fragrance direct were selling them for just £3.99 i jumped right at the chance of owning some and ordered just the two. Since using these i now know full well what i've been missing all this time because OPI are the most amazing polish i personally have ever used i only wish i had more shades from their huge collection and i will definitely purchase more in the future when i can have a splurge on myself. 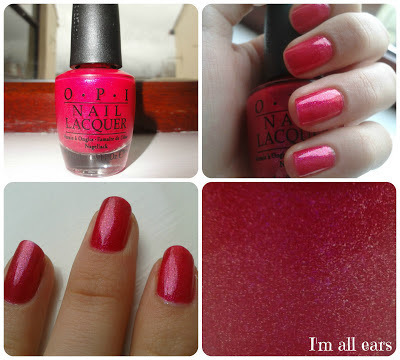 OPI are the most beautifully applied nail polishes i have ever used, there completely creamy - which i love. Apply in a few coats and last quite a while before chipping. I got Elephantastic Pink which is a beautiful barbie pink, it's so creamy and you can see in the photo's just how creamy it is. Next up is I'm all ears this is a little more sheer then creamy unlike Elephantastic pink but still applies beautifully and lasts longer then elephantasic pink for this reason. When applied it kinda reminds me of jelly. This again is a hot pink with blue undertones but also as a little red too it. It's also got lots of glitter and sparkle through out. Again another hit because i love anything that sparkes hence the name of my blog. For only £3.99 i have no complaints and there both full-sized too. I believe both these shades are from a Minnie Mouse collection. There are a decent amount of shades available at fragrance direct so get shopping before they go by clicking here. This again another brand i hear a lot about and now i know again what have been missing. Essie's we're in it together is a pale baby pink with glitters through out which give it a slight blue undertone. This one is creamy but not as creamy as the OPI elephantastic pink however i didn't find this to be a problem because again it applied beautifully and i love it. It's a great shade for spring/summer and i will wear this a lot. Again i got it from Fragrance Direct for just £1.99 - yes i know a complete bargain!! I also added some flowers (not the best) using my dotting tools. Bundle Monster - dotting tools with nail art brushes are really good. I'm dying to try their nail art stamps after a bad experience with the ones i recently got that don't work!! (not from this brand, from another) Unfortunately it's not a possibility at the moment since i waste my money on them. The tools are very easy to use, i always put a dollop of nail polish on paper before using the dotting tools it's so much easier and you get better art for it rather then trying to dip it in the pot like i did the first few times i used them lol. I'm yet to use the nail art brushes but they look great all different shapes and sizes your sure to get some decent nail art with them. Buy them here. 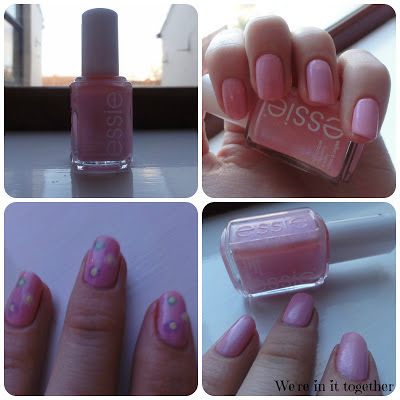 Nice polishes hun, you girlie girl :D. Glad you got to try the brands, great bargain prices too, xoxo.